As simple as can be and amazingly tasty! Walker ate an entire bar by himself and was crabbing when it was gone. These will satisfy the sweet tooth and give you protein. 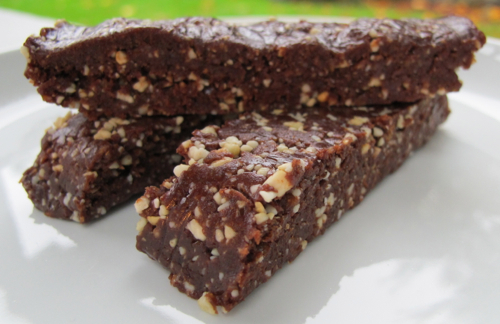 And why buy premade bars when you can make them so fresh in just a few minutes? For the dates I pick mine up at Costco, in the produce department and store them and my cashews tightly sealed in the refrigerator. Add the dates to a food processor and whirl a few times to break up. Add the cashews, cocoa powder and salt, process on high until finely chopped. Add the vanilla while running and process a bit more. Line a bread pan with plastic wrap, knock the mixture into the pan and lay the extra plastic wrap over the mixture. Press down until it is a flat bar. Let chill in the refrigerator for a couple of hours, remove and slice bars. Keep tightly wrapped in the refrigerator. If these taste as good as they look, I am sold! I make something similar to this, but roll into balls. I was just thinking the other day that they’d also work well, pressed into a tray and then cut into bars. I’ll give it a go, next time! You can also experiment with different nuts. Last time, I used half cashews, half walnuts. Slighty different taste, but still yummy….